There is a slight design flaw to the Armadillo. The back axel is located dangerously near where the drivers feet have to stand. Or maybe this is how the vehicle is powered, the driver Fred Flintstone's his feet really fast? Don't you love how I post a ton of stuff in July, and leave you with nothing in August! Bwa-ha-ha, bloggers are evil indeed. Just like this awesome Weather Dominator that I picked up. And by taking these pictures, I conjured up some sort of windstorm outside. This toy would have rocked when I was 12. 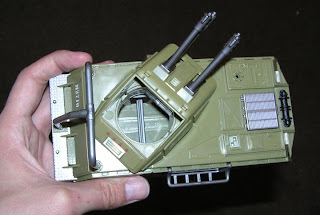 You can even take it apart into pieces for all the GI Joes and Cobras to race and find throughout your parents house! Now a days if I try this I get more "counseling" and "Prescriptions" and "surgery". Bahh! 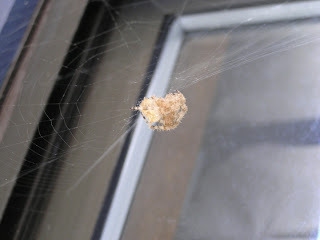 I always know fall is around the corner when this kind of spider has shown around the house. Funny thing is its usually always in the same spot, right by the sliding door. But this dude has been moving every day. At first he was on an outside rocking chair, then moved to the sliding door after a windy night. Then moved to an opposite wall when accidentally spray washed. Then he moved twice to get closer to the door light. He might just move in soon. 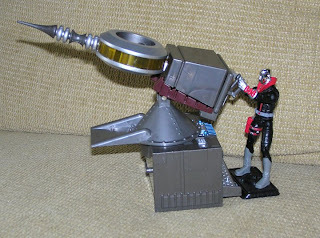 There is that darn wind storm that Destro and his Weather Dominator just started, so I hope he doesn't blow away again! 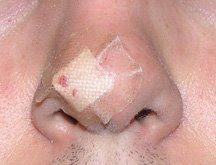 Bart the cat bit me on the nose! I HATE him! He's a jerk. Now I know a lot of you people are thinking I deserve it for those videos I made him star in, but I don't. I give him nothing but love and 'stimulating' play time. I let him sleep at the foot of the bed, I let him play outside, I let him eat extra bowls of food even though he's not allowed, I give him a special little bowl of milk every night (just a teaspon), I read him stories, I let him watch TV with me, I chase him around the house, I play laser pointer with him, I brush him, I toss him in the shower when he is dirty, I let him climb up to the tallest darkest places in the closet, I let him eat spiders, I let him wear specially designed 'Action Cats' Saturday Night Live toys around the house, I let him sleep in his comfy high pedestal, I let him drink from the bathroom faucet which is complete no-no to get your cat into, I rescued him from the neighbor's yard (which led to more blood spilt by ME), and I take him to the vet for yearly shots. So why did he bite me on the nose. What a jerk. I hit him in the face with the blood soaked wet paper towel, and he looked surprised, like what did I do? Stupid cat, hope he stays under that table I chased him under for the rest of the night. 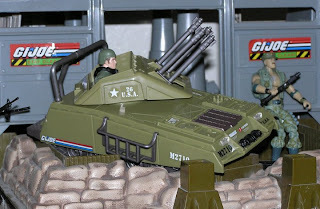 Hawk was by far my favorite GI Joe that I could buy. 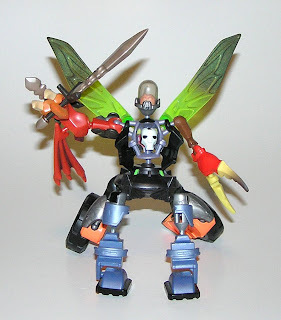 Technically Flint was my favorite, but I never was able to find one in the stores. But Hawk I found. That was a good thing. I think My first Hawk toy died of early joint disease. 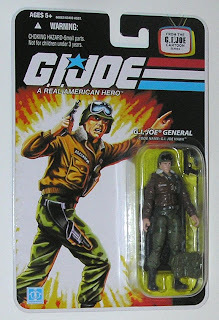 He also lost a thumb, and groin cover in battle. My Second Hawk also took a pounding, and died in some sort of 'medic mix' Lifeline prepared using various under the counter toxic bathroom cleaning materials. The Third Hawk has disappeared, I think he was dismembered by a vice grip, but I'm not certain. The fourth Hawk is my sister's, which Hordak has Joe-napped into my collection. He is missing his helmet - might have to ebay that someday. This is my fifth Hawk figure. I better, buy a couple more just for insurance. 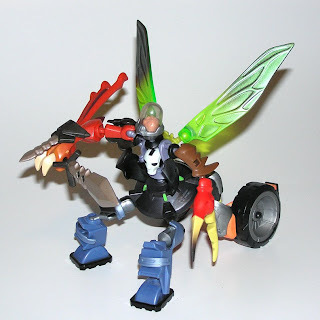 Here is a deadly combination of Xevoz parts! Not something you would like to meet in an alley that is for sure. But maybe, just maybe it would fry up the best steaks on a Barbecue? So far in the three submitted designs, the four legged combo is very popular.